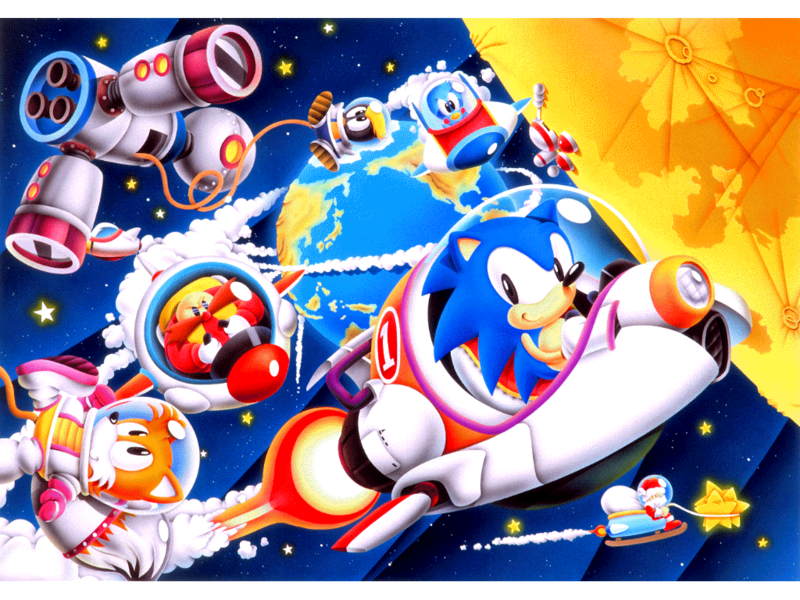 The remaining illustrations come from the incredibly rare SegaSonic 1993 Calendar and the Sega World 1995 Calendar. Each calendar had six images (two months per image) based on a theme. 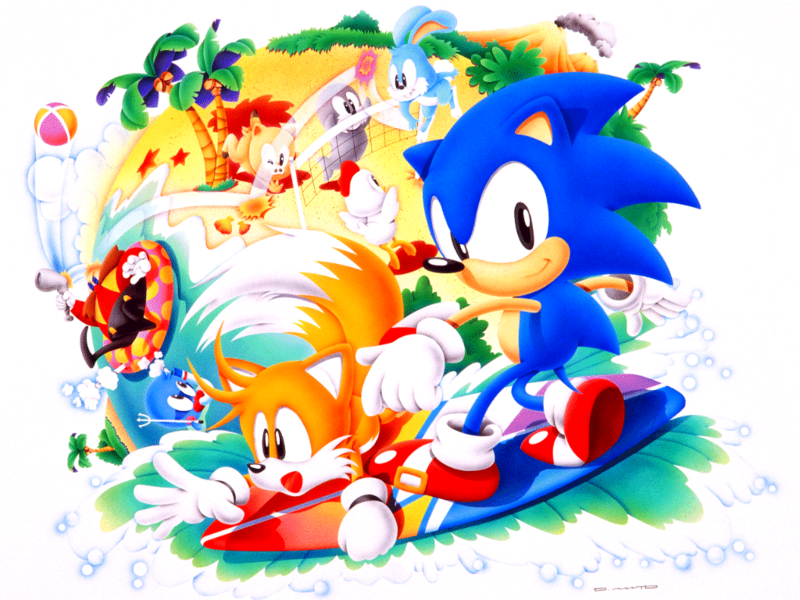 The 1993 theme was Sonic and friends riding vehicles. 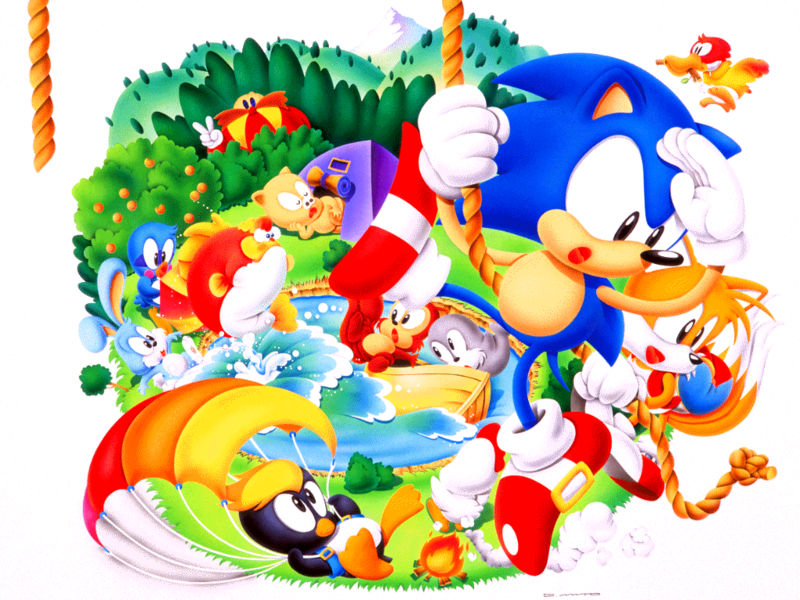 The 1995 theme was Sonic and friends hanging out at Sega World (unfortunately, one of these is missing from Screen Saver/Jam). That just leaves six Screen Saver/Jam images unaccounted for - the "globe" images. We know these weren't used on Harmony covers from 1992-1994, and it seems that the Sonic covers were dropped in 1995. But six illustrations, sharing a theme, including seasonal images (beach holiday and Christmas) - this strongly suggests that they came from a 1994 calendar. Has anyone seen any evidence of such a calendar? It's interesting that the '95 calendar would be the only one to feature both Amy and Knuckles in any capacity, well after their respective debuts. If they were used internally first then used in consumer products for the next year, that would make more sense, especially when Sonic CD was late-ish '93 and Sonic 3 was early '94. Further, only two of the five '95 set referencing the Saturn jibes with that systems late '94 Japanese launch (and the Sega Pico's mid-'94 launch, sorta). By my count there are 8 "vehicle" themed pieces (excluding bespoke Drift pieces), and 7 (arguably 8) "globe" themed pieces, with this one qualifying as either. Anyway that's sliced, we're left with at least one set not fitting the bimonthly format. Then there are exactly six of the "white void" pieces, which feature no other additional character except Flicky. I assume these were the very first set made, but what year? 1990 or 1991? 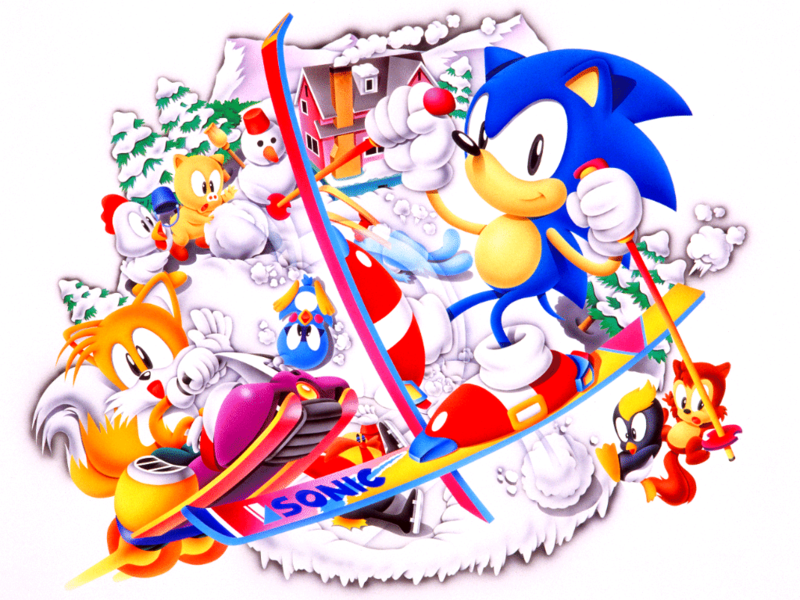 One thorough line of the "Sega World" set worth noting is that they feature Sonic in his double-hemmed gloves, as opposed to the single-hemmed featured elsewhere. It's tempting therefore to sort these chronologically by the gloves. However, every preliminary Harmony art shown by Ohshima on Twitter reveals all of them had double-hemmed gloves before the painter rendered them with single-hems. 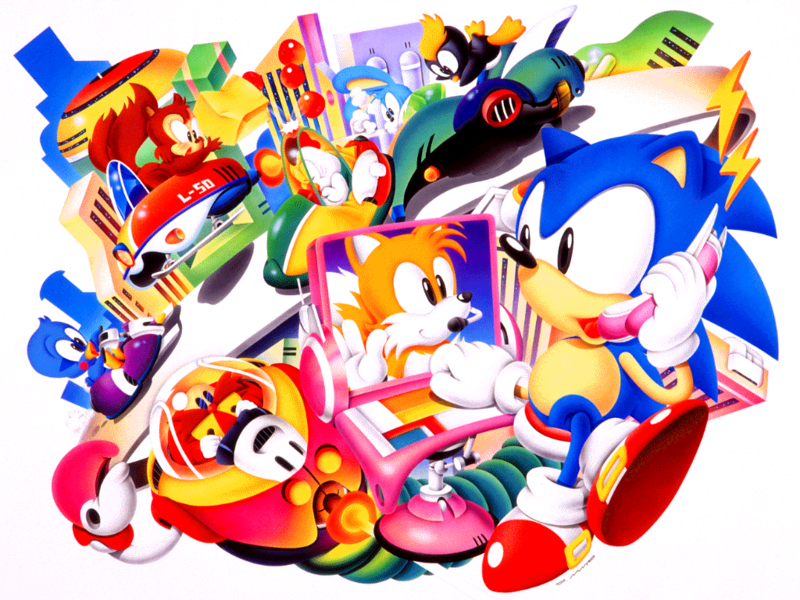 This and this could fit the "Sega World" theme, but feature the single-hemmed gloves, and moreover the former mirrors Chaotix title screen, pushing that one into the Crackers era at the earliest. There was never really any consistency to the gloves -- at least for the games -- until G Sonic. Seemingly this was at the whims of whoever painted these. What's more, the Sonic CD has double-hems in the cinematics, yet single-hems everywhere else. By my count there are 8 "vehicle" themed pieces (excluding bespoke Drift pieces), and 7 (arguably 8) "globe" themed pieces, with this one qualifying as either. Those two aren't done in the same style as the other six. And we already know that the first one is from Harmony and the second one is from the 1993 calendar. They originally had backgrounds. They were seen in various magazines in 1992 (Japanese, Korean, British) and stickers that came with Lotte brand gum. They're very rare and we haven't found clean, unobscured versions of most of them. 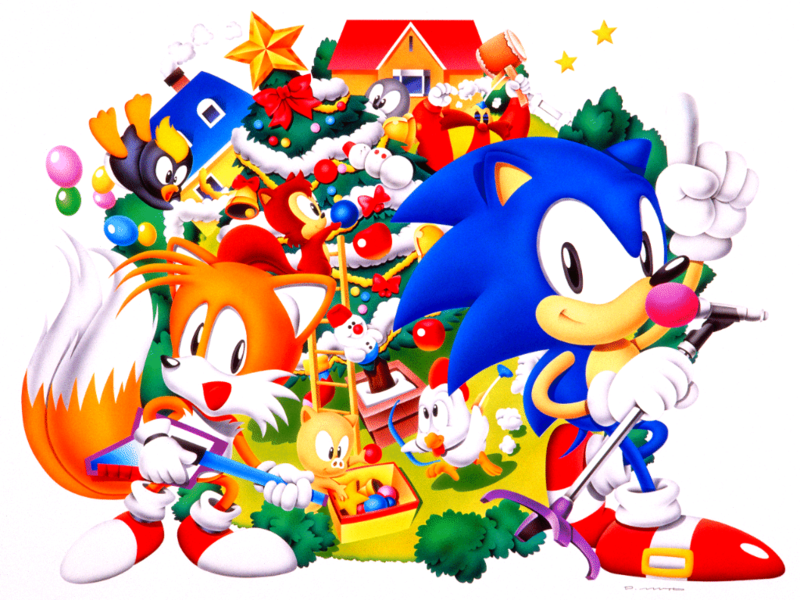 But there are six of them, and they're seasonally themed, so there's a good chance they were used in a 1992 Calendar. Of they could have been Harmony covers prior to #108. Or both. 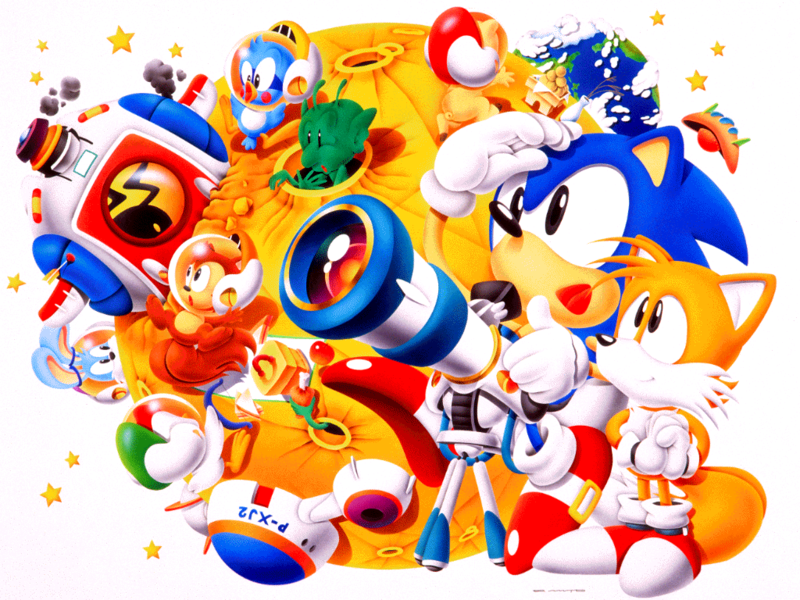 This and this could fit the "Sega World" theme, but feature the single-hemmed gloves, and moreover the former mirrors Chaotix title screen, pushing that one into the Crackers era at the earliest. Those two are confirmed Harmony cover art. There were only six images in the Sega World 1995 Calendar - there are some low-res photos in the gallery section here. Oh! I was assuming they were repurposing the Harmony covers for the calendars; I was unaware there was any distinction. 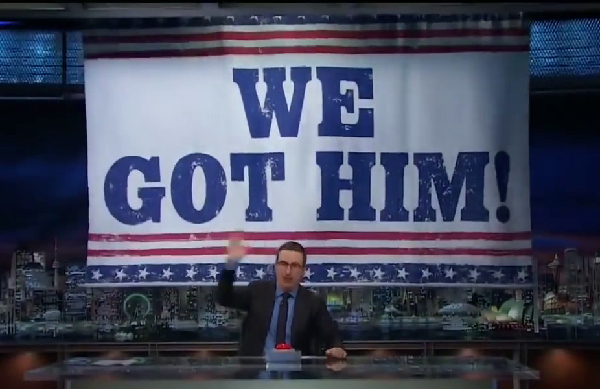 In my defense they are somewhat jumbled up, particularly the "globe" and "vehicle" pieces, among other instances. But, yeah, generally it's layed out as Harmony/calendars/games/stickers. I see that now. Those two aren't done in the same style as the other six. I didn't want to judge them on style, as there has already been shown to be discrepancy between Ohshima's pencils and the colorized finals. Oh! I was assuming they were repurposing the Harmony covers for the calendars; I was unaware there was any distinction. ^ From the above links, you can see that the 1993 and 1995 calendar art, as well as the six globe illustrations, weren't featured on the covers of Harmony #108-137 (June 1992 - May/June 1995). They don't use the same motif at all. The first six are clearly part of a set, the other two are unrelated - one is the Harmony #127 cover, the other is from the 1993 calendar. We don't have any scans of Harmony from that period - just because it's not on the cover doesn't mean the art wasn't printed inside. Think you might have to play the waiting game on this one. If a 1994 calendar exists, it will surface eventually. Alternatively it might be advertised in Japanese magazines - there's a lot unaccounted for. 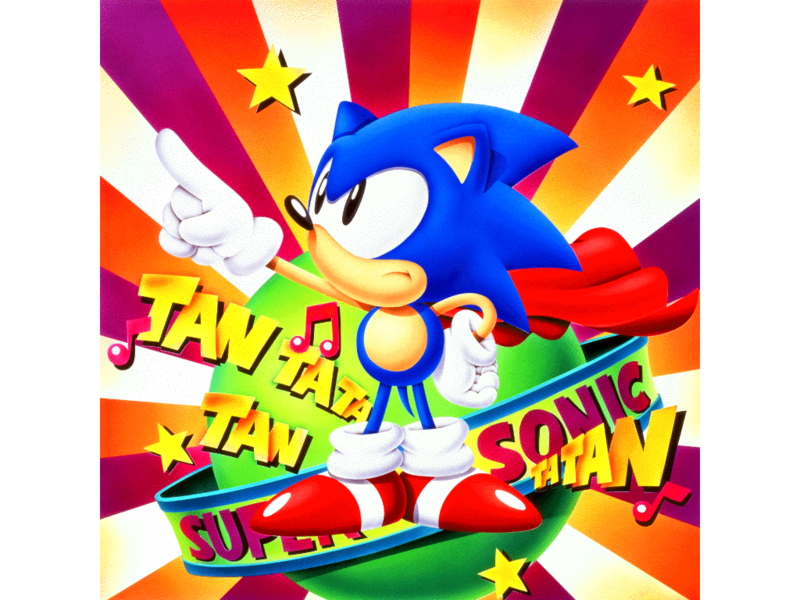 Thanks to the Sega Freaks trading cards a recent Twitter post from Masato Nishimura, we've been able to ascertain the original source of most of the art seen in Sonic the Screen Saver and Sonic Jam. Awesome find. What a modest origin for such stunning illustrations. Weren't they all drawn by Naoto Ohshima, seeing how he posted a number of early sketches on his Twitter? Sure, but who did the painting? Who's the "O. Mato" that left his signature on some of these? Granted we could probably just ask Oshima about that directly now. Alternatively it might be advertised in Japanese magazines - there's a lot unaccounted for. You're a gem Black Squirrel! Does anyone know anyone who might have this in their collection, to confirm the contents? Embarrassed I never recognized him from Psycho Fox. My god. 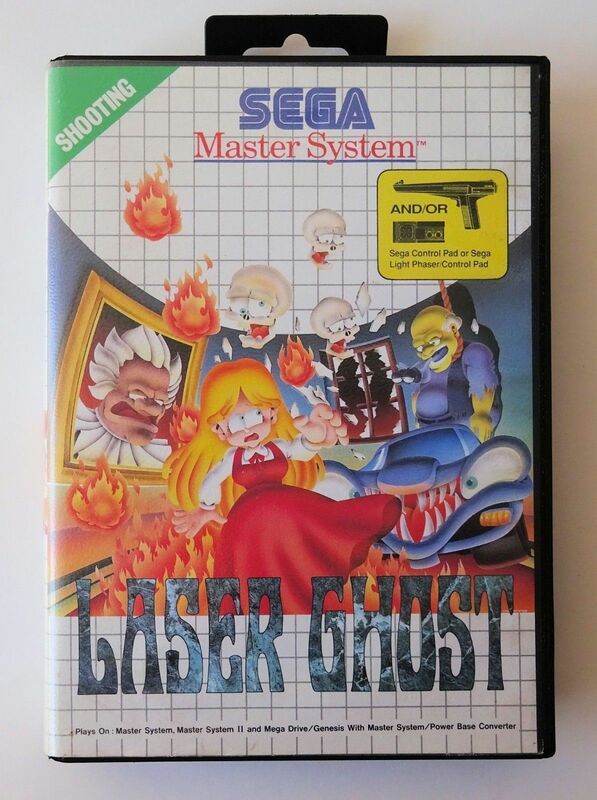 I think that's his signature on the Laser Ghost artwork. The suggestion seems to be that he did Basketball Nightmare, Psycho Fox and DJ Boy too, but it could be someone else imitating the style. There is written proof that he did Wonder Boy III: Monster Lair though. So the globe images do come from the 1994 calendar! No idea if the video says anything interesting about it.